Clubhouse with changing rooms, bar, restaurant and lounge. Pro shop with club, trolley and buggy hire. Practice facilities including driving range available on site. 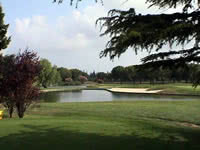 Founded in 1989 the Reus Aiguesverds golf club is a rather flat course set in olive groves and holm oaks. However this is made up for with strategically placed greens and water hazards, one par 3 green being almost entirely surrounded by water. The course boasts a beautiful masia (country house) that has been converted to form the club house. Reus Aiguesverds being a flat course, is ideal for all and can be walked without problems.